Mosquitoes are said to have been around for more than 30 million years and there are around 3000 of their species. Over the years, they have adopted the ability to locate their prey through chemical, visual and heat sensors. They can detect carbon dioxide and lactic acid from up to 100 feet away. Mosquitoes use their heat sensors to detect presence of warm blooded and mammals and birds. Although they are not visually inclined, they are able to see humans if their clothing match contrasts with the background. They are a nuisance because they spread diseases and germs through the sucking of blood. 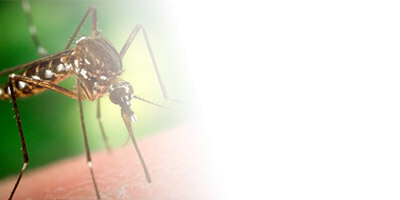 Mosquito Aedes - They include such species as the yellow-fever mosquito (Aedes aegypti) and the Asian tiger mosquito (Aedes albopictus). They are strong fliers, capable of travelling great distances (up to 75 miles/121 km) from their breeding sites. They persistently bite mammals (especially humans), mainly at dawn and in the early evening. Mosquito Anopheles - They include several species, such as the common malaria mosquito (Anopheles quadrimaculatus), that can spread malaria to humans. 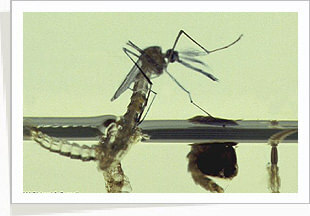 Mosquito Culex - They include several species such as the northern house mosquito (Culex pipiens). They persistently bite (preferring birds over humans) and attack at dawn or after dusk. These mosquitoes can carry many types of diseases that are caused by bacteria, parasites or viruses. These diseases include: Dengue Fever, Chikungunya, Malaria, Yellow Fever and Encephalitis. These mosquitoes can carry many types of diseases that are caused by bacteria, parasites or viruses. These diseases include: Dengue Fever, Chikungunya, Malaria, Yellow Fever and Encephalitis. Mosquitoes have a four stage life cycle, starting from an egg, larva, pupa and then finally an adult mosquito. Eggs are laid in stagnant water or on moist places such as damp soil, as water is essential for breeding to occur. The eggs are laid in 100 to 300 at a go, it usually takes the eggs to hatch in two to three days in warm water. However, some eggs remain dormant for months as they require a drying period, they hatch when in contact with water. Larvae feed on organic matter in the water. They breathe through an air tube which is extended through the water surface. They develop into pupae within a week and transform into adults in around 2 days. Since water is needed for breeding, it is needed to get rid of all sources of standing water. Our highly trained personnel will search for all active sources in your premises to prevent mosquitoes from infesting. We will also provide advice on housekeeping to ensure no stone is left unturned. Clear out any clutter from rain gutters, roofs etc.